In a large stock pot add the hominy, chicken breast and back, white onion, garlic head, a couple of large pinches of sea salt and bay leaf cover with 12 cups of filtered water. Bring to a boil over medium heat and skim any fat from the cooking liquid. Once it has been skimmed add the dry oregano. Continue to cook for 30 minutes. While that is cooking, bring water to a boil in a medium sauce-pan. Add tomatillos, and poblano peppers. Turn off heat and let sit in hot water for 15 minutes. In your blender add cilantro, 2 garlic cloves, poblanos, and tomatillos, plus 2 cups of water and 2 teaspoons of salt. Blend until smooth. Remove the chicken back, large pieces of onion and garlic head and discard. Follow by removing the chicken breasts and setting aside. Now add the tomatillo sauce, and lower the heat to medium-low. Let simmer for 30 minutes, meanwhile shred the chicken breast and add back to the soup. Taste for salt. In your blender add the tomatillos, serrano peppers, 1/2 tsp salt, 1 garlic clove, and water. Blend until smooth, add more salt to taste, set aside. 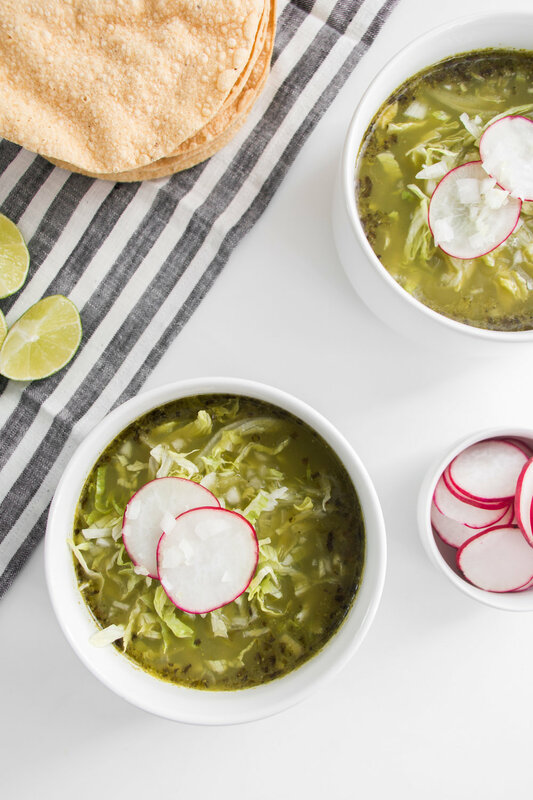 Serve pozole and top with lettuce, onion, radishes, avocado (optional) and spicy green sauce and lime to taste. Don't forget the corn tostadas, enjoy!